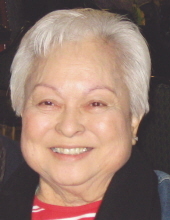 Jane Naoko Morimatsu, 87, of Honolulu, passed away on February 25, 2019. She’s a retiree from Hawaiian Telephone Company and Liberty House Fine Jewelry. Preceded in death by husband Herbert, son Keith, and grandson Chad. Survived by sons Glenn (Dora), Marc, Kevin (Marisa); daughters Caryn (Marshall) Ige, and Jeri Morimatsu; 6 grandchildren: Sherie, Kelli, Mitchell, Kent, Chanelle, Kyle; 9 great grandchildren: Mya, Danielle, Ava, Kunie, Kayla, Maddux, Lia, David, Kendall; sisters Amy Nagayama and Ann (Stanley) Miyasato. To honor her request, a private service was held. To send flowers or a remembrance gift to the family of Jane Naoko Morimatsu, please visit our Tribute Store. "Email Address" would like to share the life celebration of Jane Naoko Morimatsu. Click on the "link" to go to share a favorite memory or leave a condolence message for the family.